Earth’s last known colony, Albion, is fighting an alien enemy. In the first of the Taking Shield series, Shield Captain Bennet is dropped behind the lines to steal priceless intelligence. A dangerous job, and Bennet doesn’t need the distractions of changing relationships with his long-term partner, Joss, or with his father—or with Flynn, the new lover who will turn his world upside-down. I decided to give Gyrfalcon a try when I saw that Anna had made it free to download from all sellers. I've known Anna for a little while through a mutual publisher and several online author groups, but I'd not had much opportunity to read her work, so this seemed like a good time to rectify that. I should say off the bat that I am not a big sci-fi reader; however, that did not stop me from enjoying Gyrfalcon. I was a little lost for the first few chapters, but once I came to understand the world of the story, I slowly got caught up in the action. The writing is good and the plot interesting. This is more space opera than MM romance (I understand the romance side of things grows further along in the series), so if you're looking for a strong romance plot right from the get-go, this probably isn't for you. 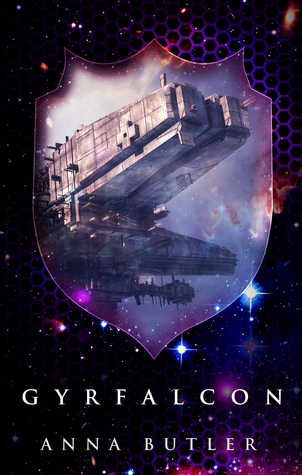 If, on the other hand, you enjoy sci-fi stories with a military theme, I can definitely recommend Gyrfalcon. Given the opportunity, I would read more in the series. I won't be rushing out to get them straightaway, but that is only a reflection on my genre preferences and not on the quality of the story and Butler's writing. For those interested in LGBT space operas, this book is well worth your time.